Gum - Forest Red "Burl Tree"
The tree is a veteran. It is entering the over mature phase of it's life, and into veteran age, where things can become a little unreliable just like The Bird Tree in NSW. Hollow native trees are an extremely valuable habitat for our unique variety of fauna such as parrots and marsupials. 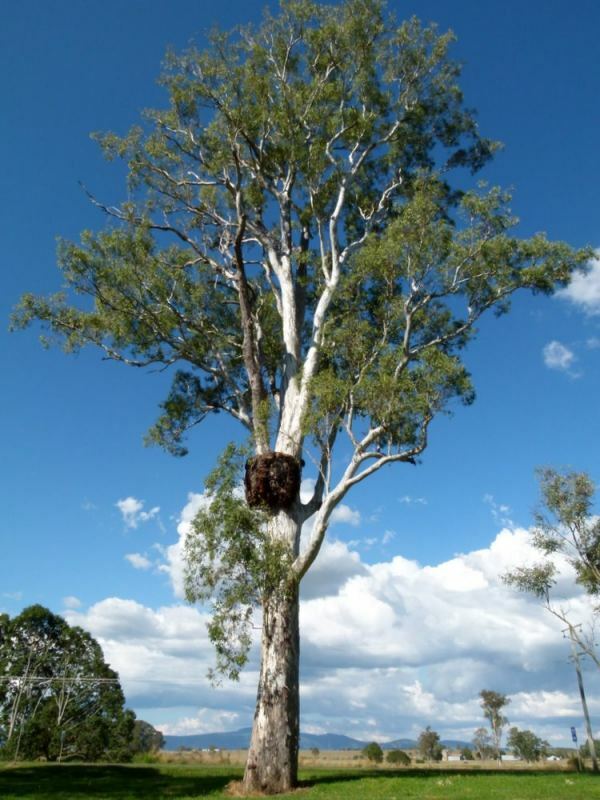 It has been said that it can take gum trees up to 75 years before they start developing hollows. This tree does have large dead wood. It also has hollows. Natural shedding is what happens in the bush, and as pieces fall off, more habitat becomes available. Dead-wooding habitat trees are very different from dead wooding urban trees. One has to be extremely careful to leave hollow stubs, and not cut anything that might be living inside. I was once dead-wooding for habitat, some old eucalypts that had a long dead but hollow branches. Had I cut the one branch back to the collar (target cut) I would have chain-sawed 4 sugar gliders inside. I left a 0.5m stub and noticed that the hollow stopped not much further than the collar. I also noticed that now the opening (aperture) was large and pesky crows could attack these sugar gliders. I carved a piece of dead wood to jam in the hole to make the opening smaller, allowing the sugar gliders to get in and out, but not a crow. The point I am making is that regular dead-wooding is not what is best. It may even be better to not dead-wood at all, and allow natural shedding ..... after all trees have been doing this for millions of years before man came along. To manage human safety just like The Bird Tree, I propose the council should fence the tree off beyond the drip-line and possibly build a viewing platform. I would mulch the area within the fence as this will help the longevity of the tree. Currently people are parking under it with large dead branches, some broken and caught up, hanging above. The weight of vehicles compacts the soil and will expedite it's demise. Even if the tree was dead, it would be a significant habitat refuge, but helping it live longer, and keeping people and their destructive habits away, would be wise. In addition it would be a prime opportunity to have a sign on the road inviting people to visit the tree. A plaque must be installed on which relevant information is given such as the scientific explanation about burls. When I was there another couple on holidays was admiring the tree, and they were very intrigued with the burl and how burls occur. Of course burls do not kill or damage trees but many people do not know that.